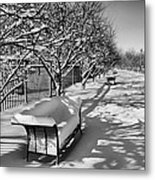 Park Benches Snow Upholstered iphone x case by Gene Sherrill. Protect your iPhone X with an impact-resistant, slim-profile, hard-shell case. The image is printed directly onto the case and wrapped around the edges for a beautiful presentation. Simply snap the case onto your iPhone X for instant protection and direct access to all of the phone's features! 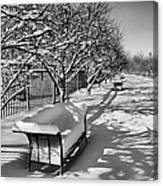 Nice story telling, crisp snow, and shadow details, Gene. 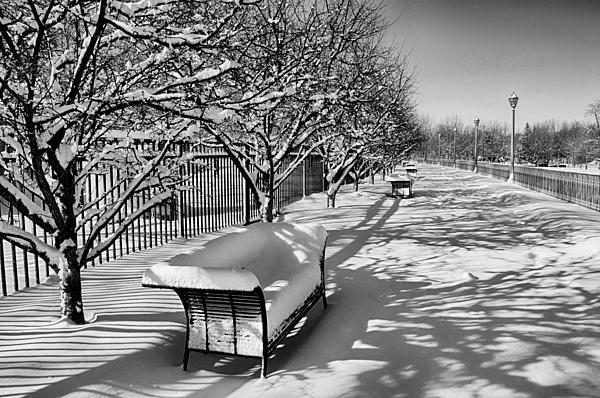 Winter is gorgeous in this image, Gene - love this in black and white. Headwaters Park in Fort Wayne, Indiana is a 30 acre park downtown and provides a setting for a wide range of public and private events including festivals, concerts and cultural events, weddings, family reunions and other parties. This walkway is located next to the pavillion (out of scene on left) and is raised above the park grounds on the right. A row of Lamplights are strategically placed along the path as are the park benches and trees providing a beautiful balance to this landscape. 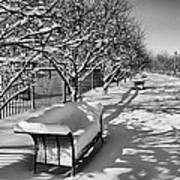 The benches, recently covered with a blanket of snow look as if they were upholstered in white.